FACT CHECK: Is Rain That Falls in Smoky Areas After a Wildfire Likely to Be “Extremely Toxic”? The one-two combination of wildfire and rain can produce some risks, but toxic rain is not one of them. Precipitation in smoky areas following a wildfire is likely to be extremely toxic. Such warnings made a specific assumption: Water that falls as precipitation in smoky areas develops toxicity prior to its hitting the ground. This is clear both in the post’s explicit statement that the rain will be “extremely toxic,” and in the implicit assumptions inherent in the post’s tips for potentially avoiding that danger. The text refers to danger to pets during the storm, for example, and suggests the water that falls on your clothing (presumably from precipitation) requires a change of garb. How this danger would present itself, although not actually described in the post, could conceivably be explained by one of two mechanisms. First, it could be that toxin-containing particulate matter in the smoke will necessarily become contained within the raindrops that fall to the ground, on your clothing, or on your pet. A second possibility is that people have conflated rain following a wildfire with acid rain, which forms in the presence of sulfuric (and to a lesser degree nitric) gases released from burning fossil fuels. Either of these mechanisms as an explanation for how rain following a wildfire could be dangerous is lacking, however. Acid rain is principally caused by the emission of sulfur dioxide (SO2) from burning fossil fuels, which becomes sulfuric acid that is incorporated into rainfall. Fossil fuels (i.e., rocks, gases, and oils derived from material that was once living but has been converted into a mess of flammable carbon-based compounds over millions of years) are naturally likely to contain sulfur compounds. Though fossil fuels are generally produced from the sulfur-free carbon of microscopic organisms, the conditions such material is exposed to over time often introduces sulfur into the chemical matrix. It is this sulfur that is most responsible for acid rain. Wildfires, on the other hand, involve the burning of currently (or recently) living carbon products such as trees and brush, which have not undergone any processes that would incorporate large quantities of sulfur into them. Therefore, the gas emitted by wildfires is dominated by carbon dioxide and carbon monoxide with little to no sulfur dioxide. These escaping gases do not serve to acidify the rain in any meaningful way. Smoke can contain thousands of individual compounds, in categories such as [particulate matter], hydrocarbons and other organic chemicals, nitrogen oxides, trace minerals, carbon monoxide, carbon dioxide, and water vapor … The health effects widely considered to be linked with wildfire smoke include exacerbation of preexisting respiratory conditions such as asthma and chronic obstructive pulmonary disease (COPD), reduced lung function, chest pain, and general symptoms such as eye irritation, fatigue, headache, dizziness, and stress. This is one of the reasons why the air quality index in regions downwind of the Camp Fire (and others) is so poor, and why people have been warned to stay inside or wear masks. If, however, the fear is that these materials will get incorporated into the rain, then that explanation is unworkable, and the reason is simple: that particulate matter is no longer there. Instead, the most dangerous particulate matter produced by the Camp Fire has been diluted and dispersed across a massive stretch of land to the south. For those two reasons, it is unlikely the rain that falls in “smoke affected areas” contains much in the way of dangerous particulate material, toxic or otherwise. Wildfires can affect the physical, chemical, and biological quality of streams, rivers, and lakes. After a fire, increased runoff provides the pathway for the transport of chemical-laden sediment to surface water, which may have substantial water quality impacts. Burning vegetation releases nutrients contained within plants including nitrate, ammonia and phosphate. At high concentrations, ammonia can be toxic to fish and other aquatic life. Elevated nutrient concentrations, especially nitrate, can be a concern if downstream uses include a public drinking water supply. Increases in nitrogen and phosphorous concentrations also may lead to algal blooms resulting in extreme daily fluctuations in oxygen or oxygen depletion as plant photosynthesis, respiration, and decomposition intensify. Anaerobic conditions (i.e., lack of oxygen) stress aquatic organisms and can alter a wide range of chemical equilibria, which may mobilize certain toxic pollutants. While these threats are real and accurately described as the result of rain falling on burned areas, it would be inaccurate to suggest that the rain itself contained toxins or other health risks. The dangerous effects would begin only after the water had fallen on the ground. Hundreds of searchers continued looking for human remains in the ashes in Paradise and outlying areas ravaged by the blaze Nov. 8, with the body count increasing daily. Rain in [the] forecast added urgency to the task: While it could help knock down the flames, it could hinder the search by washing away fragmentary remains and turning ash into a thick paste. 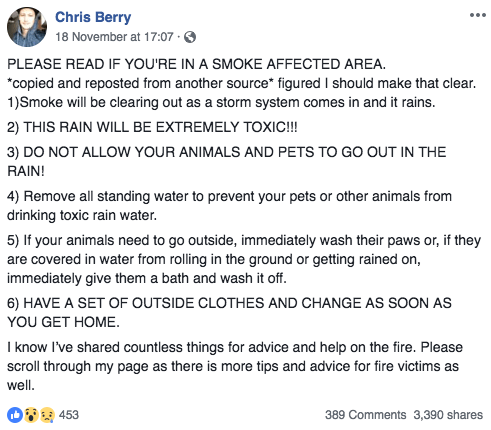 While humans and their pets should certainly avoid standing water in burned regions (which could contain chemicals leached from ash already fallen the ground), the process of having toxins rained upon you in smoky areas is not one to be worried about. 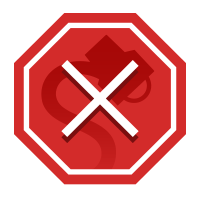 Update [26 November 2018]: Included updated language from the California Air Resource Board. Associated Press. 19 November 2018. Developments in Environmental Science. 2009. Environmental Health Perspectives. 1 September 2011. Journal of the North American Benthological Society. March 1991.